JEE Advanced 2019 Exam Schedule has been declared. The entire JEE (Advanced) 2019 Examination will be conducted in a fully computer-based test mode. 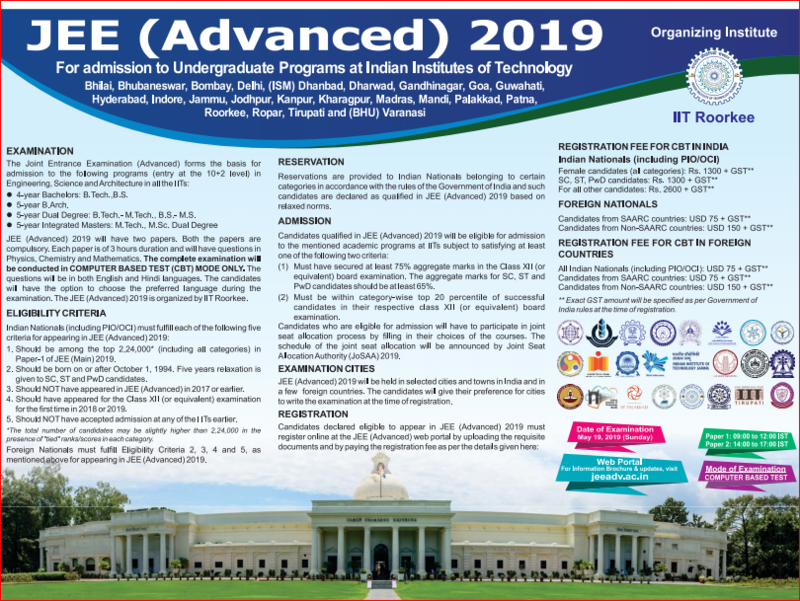 JEE Advanced 2019 will be organised by IIT Roorkee this year. As per media reports & the officials of IIT Roorkee announced the same. JEE Advanced 2019 is organised by one of seven Zonal Coordinating IIT’s guided by the Joint Admission Board (JAB). JEE Advanced is a National Level Engineering Entrance Exam to get admitted in the Bachelors, Integrated Masters and Dual Degree programs (entry at the 10+2 level) in all the IIT’s. In 2018, the JEE Advanced was conducted by the IIT Kanpur. To sit in this advanced exam, a candidate needs to clear JEE Main and this time highest score of two JEE Mains will be considered as the eligibility of this examination. National Testing Agency (NTA) is not going to conduct the JEE Advanced Exam. The Joint Entrance Examination (Advanced) 2019 will be conducted by the IITs under the guidance of the Joint Admission Board (JAB) 2019. The performance of a candidate in this examination will form the basis for admission to the Bachelor’s, Integrated Master’s and Dual Degree programs (entry at the 10+2 level) in all the IIT’s. The decisions of the JAB 2019 will be final in all matters related to JEE (Advanced) 2019 and admission to IIT’s. The Joint Entrance Examination (Advanced) forms the basis for admission to the following programs (entry at 10+2 level) in Engineering, Science and Architecture in all the IITs. 5-year Dual Degree: B.Tech. M.Tech, B.S., M.S. 5-year Integrated Masters: M.Tech., M.sc.Dual Degree. Who will conduct JEE Advanced 2019-2020? How to download JEE Advanced Admit Card 2019 Online? JEE Advanced 2019 Exam Schedule has been declared. The Application Form will be started from 03 May 2019. Click here> Application Form. JEE Advanced 2019 Exam date has been changed. The exam will be held on 27 May 2019. Click here> Exam Dates. Supreme Court has removed the age limit for IIT Entrance Examination- JEE Advance. All the students are advised to keep a close check on the official website of JEE Advanced which is jeeadv.ac.in for clarification on the order. JEE Advanced 2019 Notifications released in papers today, check exam details below. 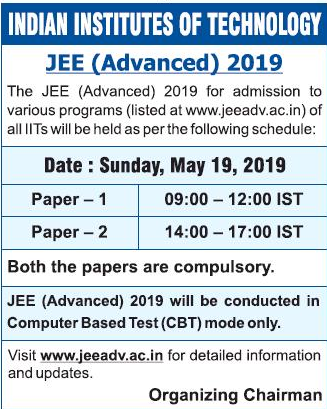 The JEE (Advanced) 2019 will be held on 27 May 2019. The entire JEE (Advanced) 2019 Examination will be conducted in a fully computer-based test mode. JEE Main April 2019 Application Form has been made available to fill from 08 February 2019. Click here to check more details about JEE Main. IITs reject the proposal to scrap JEE Advanced, B.Tech courses will be continued in all the Institutes. Recently MHRD proposed the to scrap JEE-Advanced. Students can refer IIT–PAL (Professor Assisted Learning) to prepare for the JEE Advanced Exam through the SWAYAM portal launched by MHRD. As per new announcement, JEE Main 2019 exam is going to be conducted by NTA (National Testing Agency) and the examination will be conducted twice in a year, the first attempt in January and the second in April. Candidates must read them carefully. Now advanced examination will be held in online mode only. Only top 2,24,000 lacs JEE Main rank are considered as qualified candidates for JEE Advanced Exam. The candidate must obtain positive marks in JEE Main Paper 1 irrespective of any category. Due to GST, the application fee is increased. In 2018, Few changes have introduced in the JEE Advanced examination last year. Here, the JEE advanced exam date 2019 is listed below. 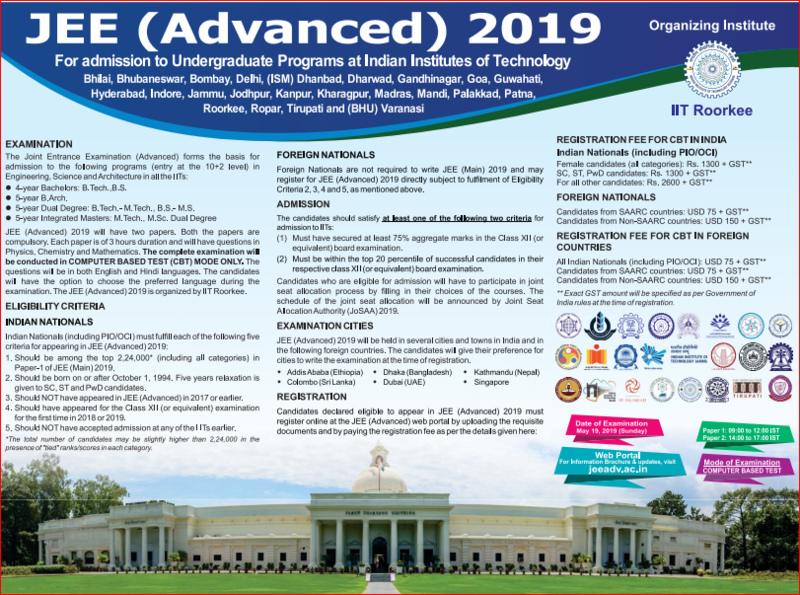 The application form for the registration for JEE Advanced will be released IIT Roorkee from 03 May 2019. As the duration to fill the application form will short the aspiring students must be quick in registering themselves for the examination. The last date to submit the application form is 09 May 2019. Hence students would probably get about a week to fill and submit the application form. Students are supposed to log in and register themselves using their JEE Main 2019 Login ID. Students are required to upload the required scanned documents with proper size file and format. Students are supposed to pay the registration fee. The fee is different for each different category the student belongs to. Hence he/she must check the amount for his/her category and pay the fee either online through credit/debit card/internet banking or offline mode as cash using SBI option. After the fee payment submit the page and take at least two printouts of the confirmation page. Online Mode: From 2019, the exam is conducted via online mode only. Number of Papers: JEE Advanced 2019 is consists of two compulsory papers (Paper 1 and Paper 2). Duration of Exam: 3 hours/each paper. Some extra time will be given to the PwD candidates. Type of Questions: Objective type (MCQs). Language of Question Paper: English and Hindi. Negative Marking: Yes, there is a provision of negative marking and different for paper 1 & 2. Previous Year Question Papers (2007 to 2018) is Available Here. List of JEE Advanced Conducting IITs is mention here. The JEE Advanced 2019 Syllabus is mentioned below. However, the syllabus for JEE Advanced Exam is comprised of physics, chemistry and mathematics subjects of 11th & 12th Class. The JEE Advanced 2019 exam conducting body released the syllabus for The JEE (Advanced) 2019 will be held on Sunday, May 27, 2019. The entire JEE (Advanced) 2019 Syllabus for Physics, Chemistry, Mathematics, Architecture Aptitude Test. Download JEE Advanced Syllabus PDF here. Physics: General, Mechanics, Thermal Physics, Electricity and Magnetism, Optics and Modern Physics. Mathematics: Algebra, Trigonometry, Analytical Geometry, Differential Calculus, Integral Calculus and Vectors. Architecture Aptitude Test (AAT) Exam: Freehand drawing, Geometrical Drawing, Three-dimensional perception, Imagination and aesthetic sensitivity and Architectural awareness. Download official Syllabus with weightage Here. The applicants must go through the guidelines mentioned below to download the JEE Advanced admit card 2019. Candidates can download the admit card from the JEE Advanced website only. The admit card will be released by the exam conducting body i.e. 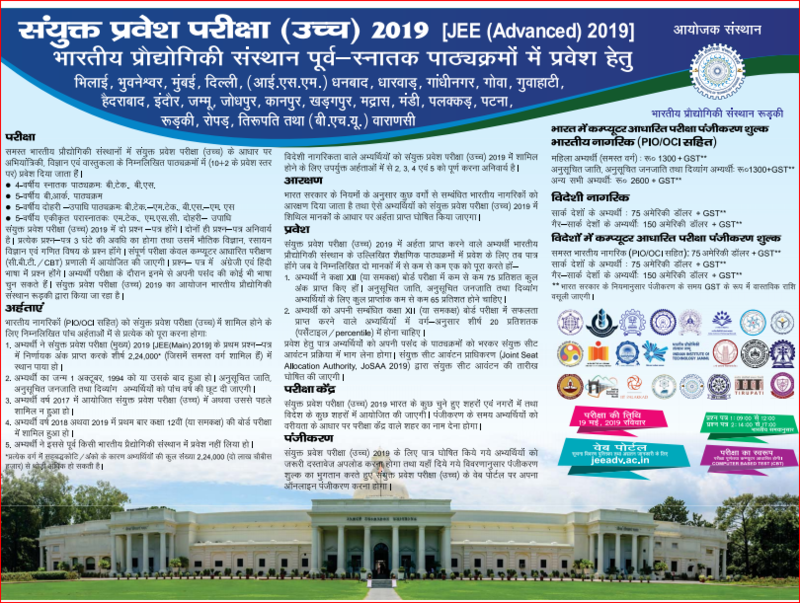 IIT Roorkee from 20 May 2019. The admit card contains all the details of a candidate i.e. photograph, signature, venue address, papers etc. In case of any discrepancy, candidates are advised to contact the Chairman, JEE (Advanced) 2019 and request the correction. Candidates must carry one original Government photo Id proof while attending the examination. The exam conducting body will release the official answer key on 04 June 2019. And candidate’s responses marked in the online exam will be sent to candidates registered email Id. The answer keys will be displayed on the official website. 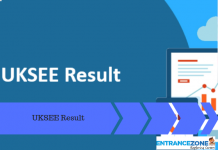 How to download the JEE Advanced 2019 official Answer Key? Go to the JEE Advanced official website i.e. www.jeeadv.ac.in. Find the link for Paper 1 & Paper 2 Answer Keys. Click on the desired answer keys. B. Architecture course is available at IIT Kharagpur and IIT Roorkee only. Candidates who will pass the JEE Advanced 2019 examination can appear in AAT later. Registration: Students willing to take B.Arch must register online at the official JEE Advanced portal to appear in AAT. Duration of Exam: The AAT test is of 3 hours. Question Paper Medium: The question is in the English language. AAT Admit Card: No separate admit card will be issued for AAT examination. Cut-off marks: The Joint Implementation committee use to decide the cut-off marks for AAT. AAT Ranking (Merit List): Applicants scoring marks above the cut-off marks will be eligible for admission in B.Architecture course. As such, there is no ranking in the AAT. The result will be announced by IIT Roorkee & JAB. The Rank List will be declared on 14 June 2019. Category Wise All India Ranks (AIR) of successful candidates will be published & available on the official JEE Advance Portal. Text messages will be sent to the candidate’s registered mobile number. No Hard Copy of Rank Cards will be sent to candidates postal address. Candidates are advised to download the JEE Advanced Result from Official Website only. However, Qualifying in JEE Advanced 2019, filling the choices and/or participating in the Joint Seat allocation process does not guarantee candidates to get admission in IITs. Admission will depend on the availability of seats during various rounds of seat allocation. NOTE: CRL is the rank list in which all candidates (across all categories) will be given ranks. Source: JEE 2016 Reports by IIT Guwahati. Allotment of the seat will be entirely based on the category-wise All India Rank in the JEE (Advanced) 2019. In JoSAA, counselling seat allotment process will begin from the third week of June to the third week of July 2019 tentatively. The complete schedule will be updated soon as JoSSA declare. The Joint Seat Allocation Authority (JoSAA) is the body to manage a centralized counselling for admission into IITs, NITs, ISM & other Government FITs. Students who will be considered qualified can participate in JoSAA seat allocation process and fill their choices of courses. Address: JEE (Advanced) Office, Indian Institute of Technology Roorkee, Roorkee, Uttarakhand, India. Foreign Nationals are not required to take JEE Main examination and may apply for advanced exam directly. jee advanced 2019 eligibility, jee advanced registration, jee advanced 2018 result, jee advanced 2019 result date, jee advanced 2018 syllabus, jee advanced cut off. Why JEE Advanced Reformation is recommended by MHRD? What is the latest news about JEE Advanced 2019 examination, is it going to be scrapped?